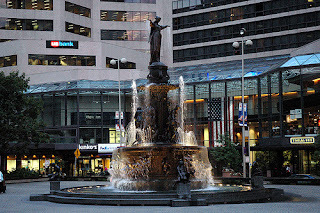 I've said in the past that I have concerns about downtown Cincinnati if a signature Cincinnati chain like Graeter's doesn't want to have a presence there. Well, there's news today that my fears have been put to rest. Well, maybe not completely, but Graeter's is finally moving back downtown, onto Fountain Square. I used to live downtown, and one Saturday afternoon I was out for a walk and three tourists stopped me and asked where the nearest Graeter's was. I had to tell them that there wasn't one downtown, and they couldn't believe it. "Downtown Cincinnati doesn't have a Graeter's?" So now I can say that there is. Good news for everyone, don't you think? Hi to every one, it's really a pleasant for me to pay a visit this web page, it includes helpful Information.